Hi everyone and welcome to the latest in the Twisted Treeline tier list series! It's been a long time since the last update since most people are busy grinding away ranked queues on Summoner's Rift. However, just so you know I haven't forgotten about you, check out the latest update to Twisted Treeline! 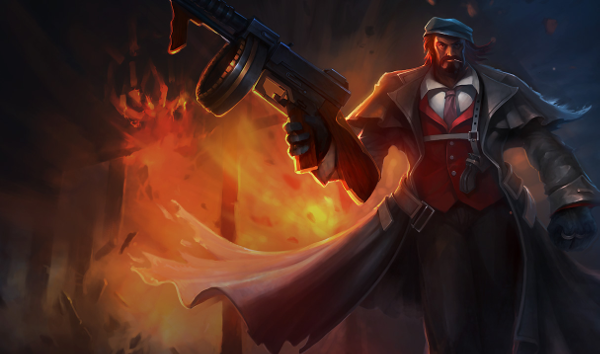 Graves and Poppy absolutely took over the Twisted Treeline as of the current patch, but common bans still include the old favorites like Dr. Mundo, Tahm Kench, and Jax. Poppy, Graves, and Illaoi are next in line in terms of common bans, which leaves people that enjoy playing Darius, Fiora, and Garen free to do so. It seems for the most part higher tier teams prefer the support meta running exhaust + ignite, whereas lower divisions seem to do better with the level advantage from having a jungler. Tier 4 [Not Played Often]: Everybody else. Not to say that you can't win with other champions, but for the most part the ones above will give you plenty to work with. Feel free to try out other strategies and post your experiences in the comment section below! Graves [God Tier Life] - As you may have surmised, a champion that's already overpowered combined with a map full of walls to give him instant burst damage just makes him well...more overpowered. His ability to maximize his burst is through the roof, and his already absurd damage goes to new heights. Viable in every position except support (maybe there too), you'll likely want to pick or ban this guy. Dr. Mundo [Tier 1 Top] - Mundo's still the #1 ban on the map, but he's mostly just banned for the sake of not seeing Mundo accidentally snowball. He's still strong for sure, but probably not a must-ban/must-pick (not that it will stop him from still being banned, but at least your team doesn't need to waste a ban on him). Illaoi [Tier 1 Top] - The Twisted Treeline gives enemy champions less lane to maneuver around incoming tentacles, which increases her 1v1 damage potential. However, less targets also means less raw tentacle quantity. This does reduce her damage somewhat, but the map is mostly beneficial to her and she can snowball very hard. Jhin [Tier 1 ADC] - Despite showing major weakness on Summoner's Rift upon release, Jhin is surprisingly not too shabby on The Twisted Treeline. His sniping ability is greatly amplified by the fact that enemies have few choices to run, and the tower positioning makes it an excellent chokepoint for sniping. Lux [Tier 2 Bot] - Similar to Jhin, Lux works well as a skillshot sniping champion. Late game her teamfight and kiting ability is excellent, but her main issue is that her level 1~2 isn't quite as good as a lot of the other low cooldown God Tier/Tier 1 mages. This means that she often falls behind in lane pushing, and/or gets an important spell flashed early and proceeds to get snowballed on from there on out. Malzahar [God Tier Bot] - When it comes to health relic control, Malzahar is essentially one of the most absurdly safe laners out there. As long as the enemy jungler doesn't pick the absolute perfect time to invade, Malzahar ensures that any invades will quickly turn into either 2v1s or the enemy bot laner losing out on a full level worth of experience. Fewer opponents also means less chance of interrupting his channeled suppression. Maokai [God Tier Support] - As a diving master and insanely strong level 2 CC bot, Maokai is the perfect example of a champion that can do it all with relatively little gold required. His Twisted Advance also allows him to drop turret aggro at well, which makes him extremely valuable in an organized setup. Olaf [Tier 1 Top] - Olaf is generally played as a pocket pick to counter AD carry compositions. Similarly, if a team is planning on running an AD carry comp they generally ban him. Poppy [God Tier Jungle] - Similar to Graves, as a champion that relies on walls to double her damage or higher, Poppy's an absolute natural on the Twisted Treeline. This coupled with her nearly undodgeable ultimate in these small corridors allows her to quickly create optimal fighting situations. She also counters a large number of popular TT champions such as Jarvan, Diana, Xin Zhao, Fiora, etc. Quinn [Tier 3 ADC] - Despite her dominance on Summoner's Rift, Quinn sees relatively little success on Twisted Treeline. The main reason for this is that there are simply so many bushes to hide in that she gets relatively little kiting done against all the high damage, gap closing bruisers. Additionally, her powerful roaming ultimate is much less effective when enemy laners are aware of the locations of all three members at all times and/or move as a group. Riven [Tier 2 Top] - Riven is one of those champions that is currently at a somewhat lower point on Twisted Treeline at the moment. However, in the hands of a skilled player she could easily be a much more powerful champion. Trundle [Tier 1 Jungle] - Trundle as a jungler and as a selection in general works quite well on this map. The small corridors act as an additional choke point, and he can easily wall off enemy champions at a variety of points by himself. Additionally, the multitude of tanky champions on this map allows him to make great use of his ultimate from any role.